Even though it is going to be your special day, you want to make sure that the guests are having fun. 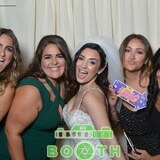 The entertainment experience can be enhanced by adding a photo booth. The wedding will not only be memorable to you but to also those who attend. You can set up a customized and fully interactive booth that allows the guests to have fun throughout the day. They will be able to capture magical moments even if they don’t have high-end phones to take pictures. You can send your guests home with personalized wedding favors at the end of the wedding ceremony. Usually, it is the guests that are supposed to gift that bride and the groom. You can step out of the box and create personalized covers that include the theme colors of the wedding with the printed photos included inside. Winter can be brutal and the sight of spring comes as a big relief. There are several bright colors you can embrace for your auspicious occasion. According to Pantone, the “Living Coral” is the best color for 2019 hence the reason to incorporate it to your wedding planning. You can use it for the décor, flowers, venue, and not forgetting the photo booth. Ideally, you want to choose a background with bright colors. This should be thought out before the wedding to ensure that there are no color clashing. The color you choose for the booth should be consistent with the overall wedding color theme. Make sure you’re aware of natural surroundings so that you can also take advantage when it comes to picking colors.